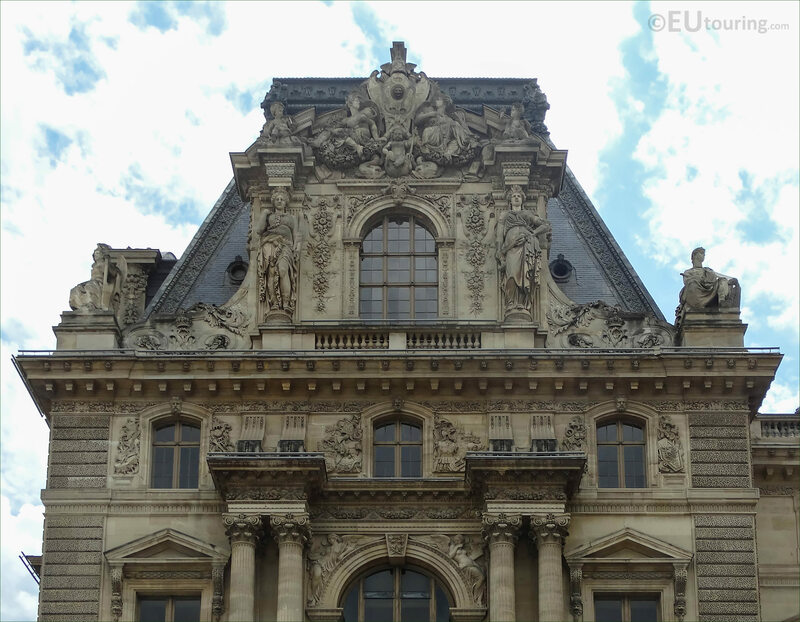 We were at the Musee du Louvre in the 1st Arrondissement of Paris when we took these high definition photos showing the top pediment sculpture called L'Agriculture et les Arts, which was produced by Eugene Lequesne. 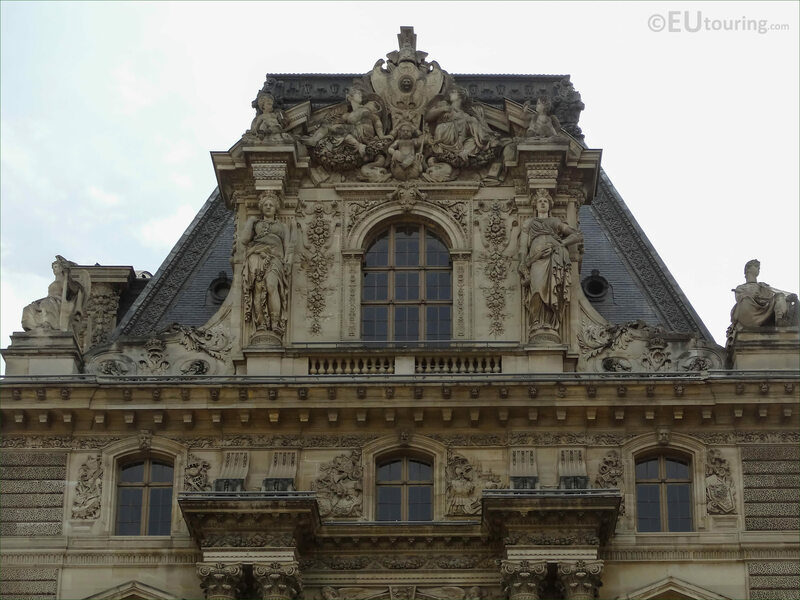 This first HD photo shows the top part of the Pavillon Mollien with its ornate sculpture details, which were put into place when the former Palais du Louvre was being renovated and additional embellishments were being added to the facade, and this pediment is called L'Agriculture et les Arts. The Agriculture and Arts pediment sculpture was produced by Eugene Lequesne, which is sometimes spelt Le Quesne, and born in Paris in 1815 he studied under James Pradier at the Ecole des Beaux Arts to become a French sculptor. Having originally come second one year, the gaining the first prize in the Prix de Rome competition, Eugene Lequesne was able to further his studies at Villa Medici in Italy, before returning to Paris, where he received many public commissions for statues including for tourist attractions such as the Palais Garnier, Luxembourg Gardens, the Gare du Nord and of course The Louvre. 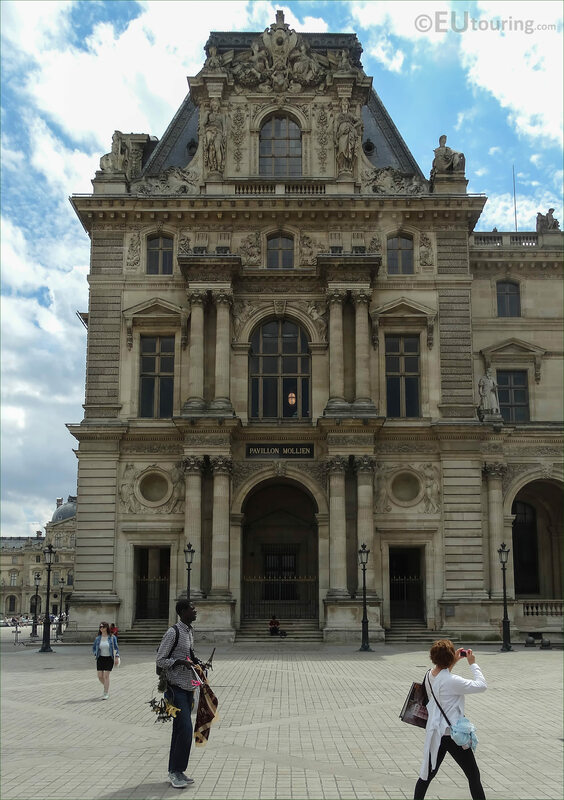 However, in this photograph you can see the entire facade of the Pavillon Mollien, and although this pavilion of the Louvre Museum is classed as within the Cour Napoleon, you would actually need to be standing within the Cour du Carrousel in order to see its western facade and L'Agriculture et les Arts pediment.